• When disturbance fragments the landscape it affects ecosystems including habitats, the variety and abundance of species, and migration corridors. • Disturbance can be the result of natural events, such as wind, drought, flood, fire, or disease. These “natural events” are very often related to human activities. Human disturbances also include air and water pollution and climate change impacts such as temperature, rainfall, and ocean chemistry. 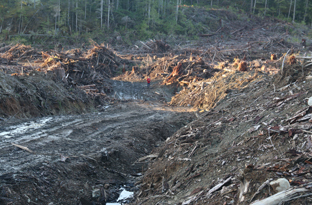 • In the Discovery Islands, logging is the single biggest terrestrial disturbance. DIEM has not mapped Disturbed Ecosystems. Community observations will be used to help establish baseline records. When buildings, road construction, logging or other development disturbances are planned, applying the precautionary principle can help minimize the impacts of these activities. It is important to consider how disturbance will (or may) affect a species or a sensitive ecosystem. 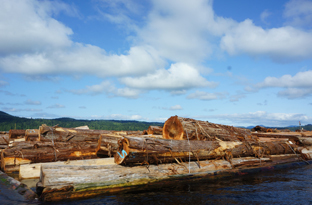 In the Discovery Islands, clear-cut logging continues to cause devastating impacts in many ecosystems. 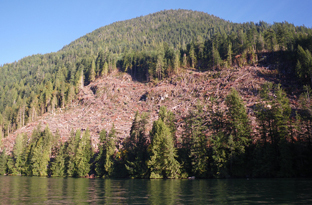 Historically, nearly all Discovery Islands forests have been clear-cut at least once. With international demand for logs accelerating, forested ecosystems remain at risk. We are a community at a critical crossroads. Our ability to identify and propose protection for sensitive ecosystems makes this an important part of planning processes. Can we continue to benefit from natural resources – while also respecting and protecting biodiversity? Invasive species – Introduction of non-native plants and animals is one of the greatest threats to sensitive ecosystems, because they frequently disrupt or displace established plant and animal communities. Disturbed areas offer openings for invasive species to establish through natural migration or unintentionally as seeds on clothing or equipment. 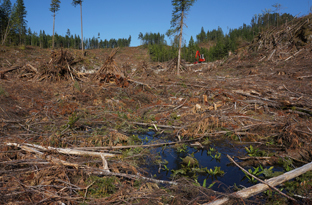 Dense young forest: Within a few seasons, the light-induced food-rich habitat of a clearcut becomes a dense, dark and impenetrable young forest which is a severely limited habitat that lasts for 20-30 years. Riparian: Riparian ecosystems support high biodiversity. Wildlife habitat is lost when riparian travel corridors are fragmented or exposed. Impacts that damage streamside vegetation affect water levels cause seasonal flooding, drought, bank erosion, and loss of key substrates, such as spawning gravels. Herbaceous: The shallow soils and sensitive vegetation of herbaceous ecosystems are easily damaged by soil compaction and erosion, and loss of their rare flowering plants, mosses and lichens. Developments, roads, and rock quarrying all alter these rocky habitats and their delicate species, including introduction of non-native invasives. Ocean impacts: Human activity damage marine ecosystems in many ways, frequently as various kinds of pollution from careless waste disposal. Other disturbances result from sediment runoff, shoreline and in-water dumping, and excavation. Biological disturbances result from over-harvesting or trapping/removing some species, which upsets ecosystem connections. Bilge water and marine travel can introduce diseases, invasive species, and other unforeseen changes. 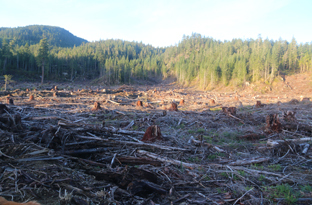 At first the clear-cut habitat may offer increased food resources, so many species are attracted to these areas, however recent clearcuts offer little cover for protection from predators, including humans. 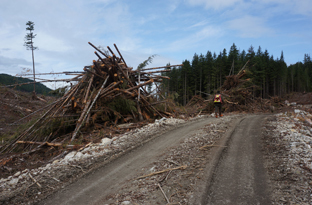 Clearcut habitats are also more exposed to weather and animals may become trapped and perish in snow and cold – or hot and dry conditions. 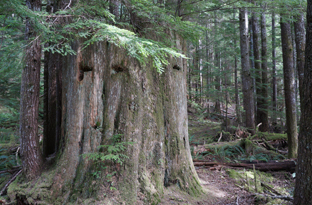 The forest ecosystem and other dependent species are impacted when coastal rains wash away soil and vital nutrients from exposed disturbed landscapes. 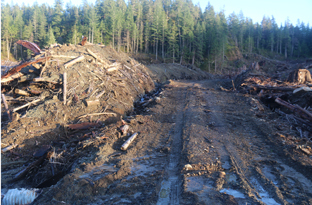 Forest habitat is gone from these sites; the ecosystems are fragmented. 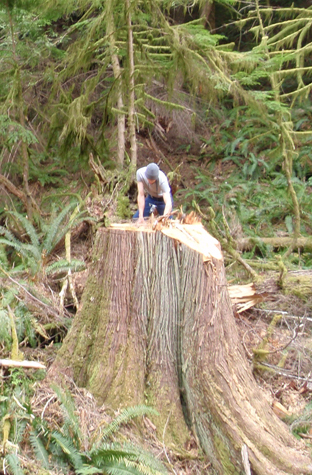 Lost are those species that relied on trees, particularly large tree habitat for foraging, nesting, denning or travel. Species connections and linkages are broken, ecosystem integrity is destroyed. 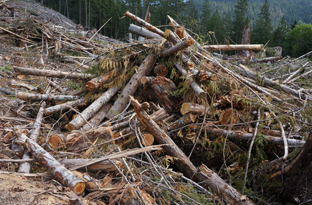 Pacific wrens happily nest in slash- piles and amphibians are also attracted to these moist log habitats. 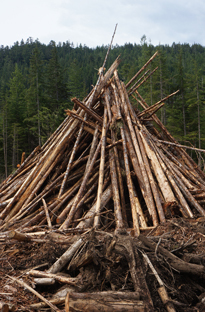 When log piles are ignited, insects, birds and their nests, and amphibians burn. If some escape fire, they face predators, starvation, or dehydration without this cover.